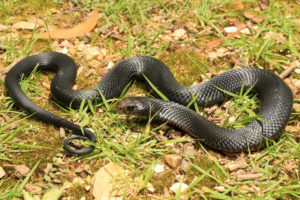 The Red Bellied Black Snake is a primarily diurnal snake, favouring marshy and wetland areas where frogs are plentiful. These snakes are far more placid than some of the other snakes that can be found on the Gold Coast, despite their reputation. 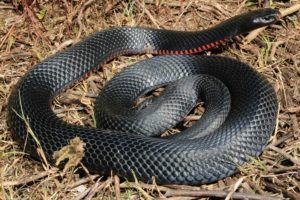 These snakes vary little in colour, with all snakes having a jet black colouration on the back, with a gradient of vibrant blood-red on the belly. Some specimens however have been recorded as having a white belly however this is uncommon. In the presence of a threat, these snakes will flatten out their neck almost like a cobra, before striking if continually provoked. After each mating season, pregnant females will give birth to a live-clutch of between 8 to 40 young.